World 3-3 (Chapter 3-3 in Yume Kōjō: Doki Doki Panic; titled Huh? or Attack Dungeon!!!) is the third level of World 3 in Super Mario Bros. 2. World 3-3 starts in the underground, with no obstacles, and a door is at the end. In the next room, there are a Shyguy riding an Ostro, Albatosses, Bob-Ombs, and another door. When entering this door, the player is inside, where Ninjis and Sparks await, while the next door is located at the other side of the enemies. In the next room; when the player enters the door; a tall room awaits, full of Sparks, and the player must scale to the top, where the next door awaits. When entering this door, the player is in another tall room, with Tweeters, Snifits, Shyguys, Pansers, and a Ninji awaiting, with the door at the bottom. Shyguys await in the next room, along with the next door. Located in the next door, leading to the roof of the fortress full of Ninjis, is the Crystal Ball at the end. Located in the lair is the second Mouser battle (or Robirdo in Super Mario Advance). When the boss is defeated, a door appears, and World 3 has been completed. 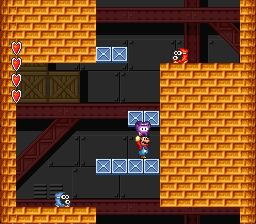 This level is notable for containing the only red Snifit in the game. Despite all Snifits being depicted as red in official art, the only one in the game is in a room in this level, standing on a ledge. The first coin is above the ledge before the door. The second coin is on the topmost point in the door right next to the locked door. The third coin is under the fourth platform and next to the third platform that make a zig-zag. The fourth coin is right above the door that leads outside. The last coin is up and to the right of Mask Gate. The first egg is on the tallest post. The second egg is on the platform with the Ninjis and Sparks. The Magical Potion is up the two ladders. This is the only level in the Super Mario All-Stars version to play the overworld music right before grabbing the Crystal Ball to enter the world's final boss. ↑ Nintendo Power Volume 2, page 48. ↑ Super Mario Bros. 2 Inside Out, Part I. Page 24. This page was last edited on April 6, 2019, at 14:51.